A brand new Phraseanet Report! Now, only 3 main tabs are being displayed: Connections, Downloads and Databox Content. 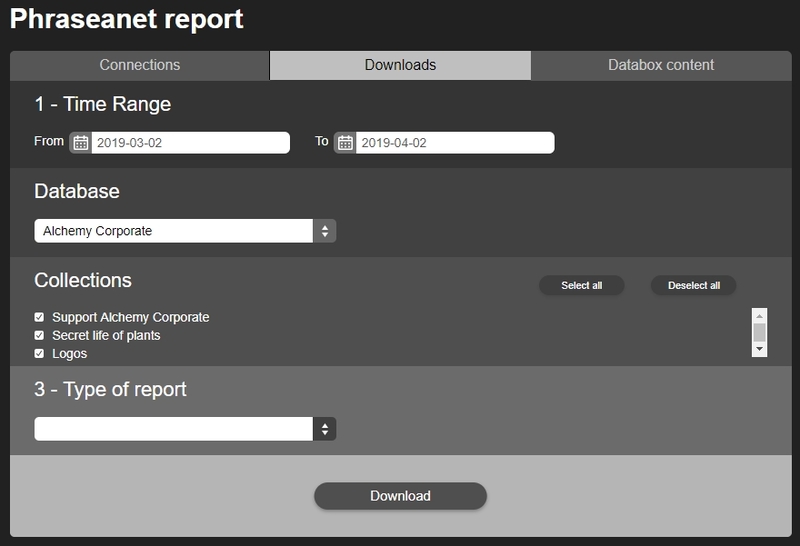 Brand new in this Report interface: the possibility to download the databox content! Choose a time range, a database, one or several collections and the fields. 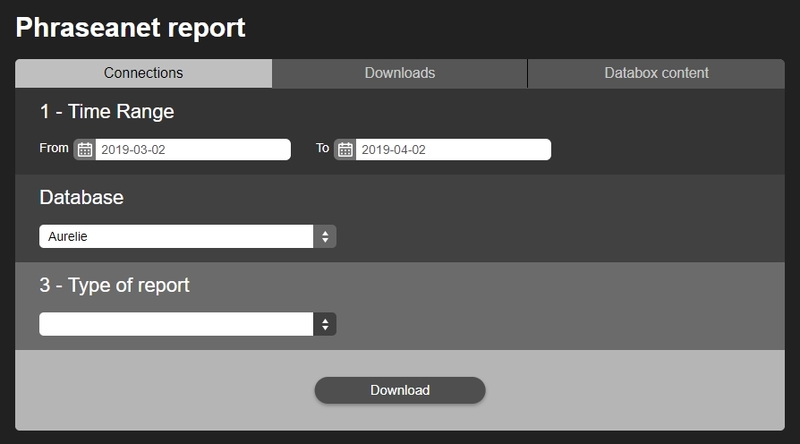 Then click on Download to view the .csv report. A new version of Phraseanet has been released ! Download it here on our official website. We remind you that the previous releases are still available and can be downloaded for free from this page. -For Office Documents, all generated subviews will be PDF assets by default. The flexpaper preview still exists but will be optional. -In Prod Gui, there will be 5 facets but the possibility to view more. Artificial intelligence: Phraseanet 4.0.3 allows assisted batch indexing by submitting media files to AI search engines: auto keywording, facial recognition of celebrities. Also, you will be able to find your documents using the colors in the facets (AI plugin). The 4.x releases are compliant with the Phraseanet plugins for the Adobe CC suite (InDesign, Photoshop). Also in version 4.0.3: We have extended autoregistration and added wildcard access condition by mail domain; Automatically grant access to a user according to the email entered in the request. 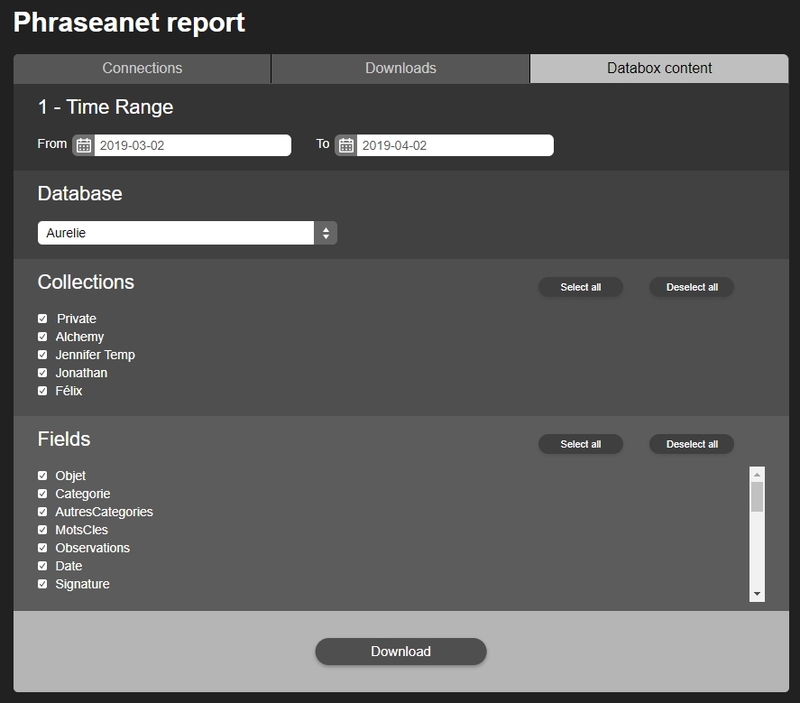 Release of Phraseanet 4.0: VM now available! This virtual machine contains a Phraseanet server and all its dependencies. It allows you to test Phraseanet quickly and efficiently, as if you were working in a production environment! Please feel free to send your feedback: tell us what you think about this new version, if you have any suggestions for enhancements! Phraseanet now features one of the most advanced open source search engines, Elastic. We are releasing Phraseanet 3.8.8 today! Lots of enhancements in this version, including adding public, temporary links for the assets (link generation based on JSON Web Token), more API routes, setting up compatibility of Elasticsearch (a pre-installed VM will be available by the end of the year, sources of Phraseanet 4.0 can already be found on our GitHub repository). Our team also released the WebGalleries Plugin, which allow the users to publish and share their Phraseanet media content. Setup of a webgallery through a permalink or an iframe. Please contact us for more information about this plugin! The link contains the sender users’ ID, it is then possible to trace what has been shared. It is timestamped and has an expiration date. It is possible to ask from 1 second to any number, 7200 seconds by default. It is possible to revoke everything that has been shared, generated by a user. The link is unique for the current session. Use case: I want to provide resources for a limited period of time. It is now possible as a console on the server, to ask to recreate a specific sub definition (thumbnail, preview…) for a type of record (image, document, video, audio), on a specific database for a range of records. It is also possible to force the recreation of sub definitions that have been defined manually or uploaded via the API. -NewFeature: Adding the possibility to upload a document without creating its sub definitions. Combination of both features allow to add documents to a database, to delegate the coding of the subdefinitions to an external process ( video coding), then to add the sub definitions computed as sub definitions of the record previously created. -Enhancement: HIM, Prod, Deactivation of a permalink for a subdef: when the link is deactivated, a 404 error is returned. -Enhancement: HIM, Prod, the sub definitions defined manually are applied to all static subdefinitions of the video. A new webinar will take place on July 21 and will be in French. If you are interested to attend one of our webinars, feel free to contact us here and we will organize a new session in English ! Release of Phraseanet 3.8.6 ! We are pleased to announce the release of the new version of our Digital Asset Management software, Phraseanet. You will find the changelog below. You can download this release from www.phraseanet.com/en/download ! -BugFix: In the detailed view, fixes the list of the stories titles which is truncated. -BugFix: Fixes Oauth 2.0, the authorization of the client applications is not systematically requested when logging in. -BugFix: When being redirected, fixes the add of parameters after login. -BugFix: Fixes the thumbnails’ size of EPS files. -BugFix: The “Delete” action of a task (“Record Mover” type) is now taken into consideration. -BuxFix: Writing of IPTC fields is fixed, when setting up a stamp on a media (image type). -Enhancement: Reporting modifications of Flickr & Dailymotion APIs (Bridge feature). -Enhancement: Adding an extended format for the API replies. Get more information about Phraseanet records in one API request. -Enhancement: Adding a Vagrant VM (for developers and testers). The setup is quicker: development environments made easy. -Enhancement: Adding a command for the file generation crossdomain.xml depending on the configuration. Phraseanet 3.8.5 new release available ! Hello, Phraseanet 3.8.5 is now available ! Phraseanet 3.8.4 is now available ! The new release of Phraseanet is available as of today ! Here’s the complete changelog where you can find details about bugfixes and enhancements in this version. Don’t forget to visit our Download page !